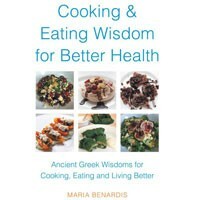 My book “Cooking & Eating Wisdom for Better Health” (BALBOA PRESS) awakens people to the ancient Greek wisdoms for cooking and eating for better health and longevity. In ancient Greece they practiced ‘wisdom healing’: using food to nourish the mind, body and soul. “Let medicine be thy food and food thy medicine”. ‘Nature itself is the best physician.” – Hippocrates. Some of this wisdom is explored in this BLOG. In ancient Greece that were many who loved to 200 years old. Why is it that in today’s technologically and scientifically sophisticated society, many people cannot achieve longevity? The ancient Greeks introduced the world to the concept of energy (from the Greek word energia) and its affects on humans, animals, plants and one’s health. We are all connected spiritually by energy, whether we choose to believe it or not. The ancient Greeks would preach that ‘we are all one’ “love is the cause of unity of all things” – Aristotle. We all form a part of the circle of life that revolves in a circular motion with no beginning and no end, particularly when it comes to cooking and eating and respecting our food and where it comes from. The ancient Greeks knew that if the food they were cooking had good energy and brought “agapi” (unconditional love), their dishes would be masterpieces — and masterpieces they were. We are all made up of energy and we therefore require the consumption of energy in the form of food, air and water for sustenance and good health. In tandem we require an environment and thoughts made up of good positive vibrational energy. The ancient Greeks would “think good thoughts”, live life with agapi and practice affirmations to assist with this process. There are many methods for raising our vibration to connect to ourselves, nature and God. This includes eating highly nutritious energetic foods and eliminating unhealthy thoughts and relationships. Eating high energy foods help us reach higher consciousness and to better connect with our higher source; God. This is one of the reasons why many ancient philosophers and healers were vegetarians such as Plato and Pythagoras When eating fresh fruits and vegetables off the plant, tree or vine the vibrational energy benefit of the food is high. When you eat organic food directly from the plant the plant is rich in nutrients from the sun. Most fast food restaurants, large grocery food chains, even middle of the line eateries offer food that is of a very low energy vibrational quality thus not adding any valuable nutrients to the body. Eating high amounts of these foods can result in sickness, obesity, stress, and other health issues. Eating food that has conscious, good vibrational energy does not nourish you only physically but also spiritually and harmoniously. Many of us have lost touch or forgotten the nutritional benefits and healing qualities of food and opt to solely rely on conventional medication for healing. Instead, we should be looking at supplementing these conventional methods with holistic approaches, such as eating the right foods for our particular ailment, and using methods such as naturopathy, massage, music, dream therapy, salt therapy, music therapy, sun therapy, chakra therapy and colour therapy, as they did in ancient Greece. A way to attain a place of agapi and to lift energy is to adopt an agapi and eco (not an ego) approach to cooking. An eco approach takes into consideration the environment and other people. It reminds us that we are not alone and that our choices have consequences not only on ourselves, but on the environment and other people. When we are free from ego when cooking and come from a state of agapi we lift the vibrational frequency of our ingredients and dishes and we begin to add a healing element to our dishes. Food that is prepared by loving hands adds to the good energy of the dish. Prepare food slowly, lovingly and peacefully. Many other rituals from ancient Greece continue to be practiced today to lift the energy vibration frequency of food before it is consumed. There are many songs and dances performed during preparation and cooking time, dishes are kissed and dishes are blessed. Ingredients are not merely something we consume to sustain us; it is something deeper and more spiritual. But, above all, the Greeks show gratitude by giving thanks to God for his guidance and for the wonderful food they are about to enjoy. Gratitude, truth and love have the highest energy vibrations. For good health eat an abundance of food with high vibration energy and nutrients such as organic nuts, fruit, vegetables and fresh herbs. Keep to a minimum foods such as meat, poultry and sugar and foods that are highly processed, microwaved, chemically altered, genetically altered (GMO), contain chemically additives or have being mistreated by a person. They have little or no good vibrational energy and nutrition to add to your body. Plutarch tells us: ‘Man is by nature not a carnivorous animal’. ‘It is not natural to mankind to feed on flesh, we first of all demonstrate from the very shape and figure of the body. For the human body no way resembles those that were born for ravenousness’. ‘Shall we reckon a soul to be a small expense.’ ‘Animal food is injurious: it clogs and confuses the mind’ and the ‘mind weak and feeble’. It operates unfavourably on character’. ‘If we must eat flesh let it be with sorrow and pity; not tormenting and abusing the poor animal before taking its life. Animals have senses’. ‘Who knows the bodies of animals may contain the souls of deceased men.’ When we eat animal meat where the animal has not been treated with respect or not slaughtered with respect we are also placing the energy of pain into our body. Blessing the meat is imperative. To lift the energy vibration of your food give thanks and bless your food before eating and even while preparing and cooking it to decrease the negative energy vibration left on these ingredients when eating it is also important to create an ambience of peacefulness. Think positive thoughts and pour your own energy into what you are eating. Low -Phobias, addictions, anxiety, stress worry and having a negative outlook on life -Genetically modified (GMO) food, and conventional food that has been treated with chemicals and pesticides -White rice and flours -Sugars, sweeteners (artificial etc) -Coffee -Sodas -Alcohol -Meat, fish and poultry -Processed, packaged, canned and fast foods -Unhealthy oils e.g. canola, cottonseed, margarine, lard and vegetable oils -Frozen foods -Pasteurized cows milk, yoghurt and cheese -Cooked foods, deep fried foods and microwaving food Affirmation: I eat high energy vibration food that nourishes, nurtures and supports my body and soul.